In March 1992, Commissioner Carl Rosier adopted as policy the Alaska Department of Fish and Game Writing Standards to provide consistent word usage for department publications. 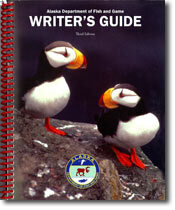 Now in its third edition, the Alaska Department of Fish and Game Writer’s Guide (PDF 1,833 kB) provides direction for department authors as well as a reference for those seeking better understanding of the department’s work. Divisions may make their own policies and procedures for publications and may provide specific guidelines or templates for those processes. Department authors should consult their publications specialists for further guidelines. All department works are copyrighted by the department, per Standard Operating Procedure III-401, which is also summarized on the web page footer below. When writing for video or audio production, department authors should consult relevant Standard Operating Procedures and other department policy, including review procedures. Contact the department communications director for more information. This table of contents listing is also available as part of the Introduction (PDF 201 kB) file. Staff wishing to suggest additions or make corrections to the material in this ADF&G Writer's Guide can do so by contacting ADF&G Writer's Guide Submissions.